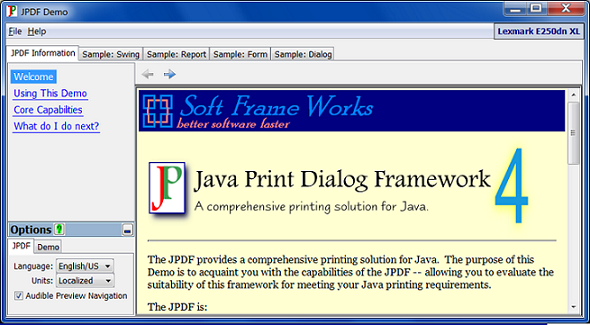 The JPDF Demo is an interactive Java Swing application which demonstrates the capabilities of the JPDF. The purpose of this Demo is to quickly acquaint you with the capabilities of the JPDF -- allowing you to evaluate the suitability of this framework for meeting the printing requirements of your application. The JPDF Demo is available for download from this web site. The JPDF Demo is distributed in a compressed zip file. To run the Demo, unzip the file, and execute the provided batch file (assumes that you have the JRE installed on your machine). To remove the Demo from your machine, simply delete the directory to which you unzipped it. Packaged with the Demo are several small Sample Code Applications which illustrate how JPDF capabilities are invoked from Java code. Click the reduced-size screen image above to display the full-size version.